We lived in Tokyo for almost 3 years, an amazing and unforgettable experience. 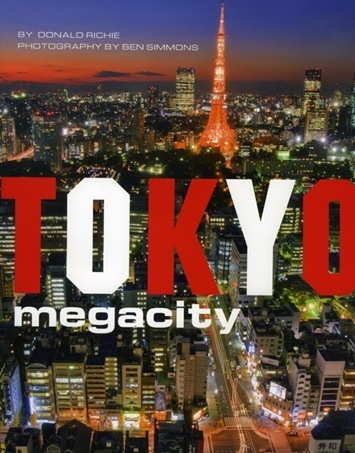 As we left to return home in Canada last summer (July 2010), a book about Tokyo by Donald Richie was just published titled Tokyo Megacity so we bought it at Tsutaya Roppongi for about 3,500 yen. With over 250 beautiful pictures by well-known photographer Ben Simmons, the book describes Tokyo as a patchwork of villages, but combines old and the new, and is both traditional and trendy. With the Imperial Palace as the starting point, it breaks Tokyo into three distinct areas: Low City, Mid-City and High City. We lived in one of the areas (Roppongi) and have visited and blogged about the others. The only major area missing is Ikebukuro. This book currently sits on our coffee table in our living room back in Canada. We hope to return to Tokyo soon for a visit. Note: This review of this book also appeared in Japan Today. The opinions and interests expressed on this blog are my own and don't necessarily represent my employer's positions, strategies or views.